The iconic Byculla Souffle was the signature dish of the elite Byculla Club (1833-1920). Prepared with copious amounts of liqueur including Kummel, Chartreuse, Curacao, and Benedictine you can make it dark rum, Amaretto, Grand Marnier or a combination of other sweetened liqueurs. If you prefer you could also just flavor it with vanilla extract. In a double boiler, over a slow flame dissolve the sugar in the milk. When the milk reaches a boil quickly pour over the whisked egg yolks while whisking continuously. Return mixture from bowl to double boiler on a slow flame. Keep stirring. Add vanilla and keep stirring until milk begins to thicken. Do not increase the flame or the custard may curdle. Once you have a thick custard (it will thicken as it cools as well), remove immediately from flame and pour through a fine sieve into a glass bowl to remove any eggy bits. To know if you have thickened the custard adequately run a spatula across the bottom. If the custard parts in the center you should stop cooking it. If you want to add alcohol to this custard now is the time. Cover the custard tightly with plastic wrap, press the plastic wrap directly over the custard, to prevent a skin from forming on the custard. Refrigerate 2 hours. Sprinkle the gelatin evenly across the surface of 1.5 tablespoons of room temperature water. Do not stir this mixture. Just let rest until the gelatin looks puffy about 8-10 minutes. Place the bowl in a larger bowl or saucepan with enough hot water to come halfway up the bowl. Let the bowl sit in the hot water until gelatin has dissolved. Don’t stir it. Remove the cooling custard from the fridge. Discard plastic wrap and gently using a whisk stir the custard. As you whisk it, slowly add the gelatin. When thoroughly incorporated, cover custard with plastic wrap tightly, pressing down so the plastic touches the surface of the custard and return to the refrigerator for a half hour. Whip the egg whites to stiff peaks. Whip the chilled cream to soft peaks. Remove the custard from the refrigerator and whip in the cream until well incorporated. Use a spatula to do this. The ideal motion is a figure of 8. Then using a gentle and inward motion whisk the egg whites into the custard. Pour into a large bowl 1.5 liter bowl or 6-8 individual glasses or cups of your choice, cover tightly and refrigerate 5-6 hours. 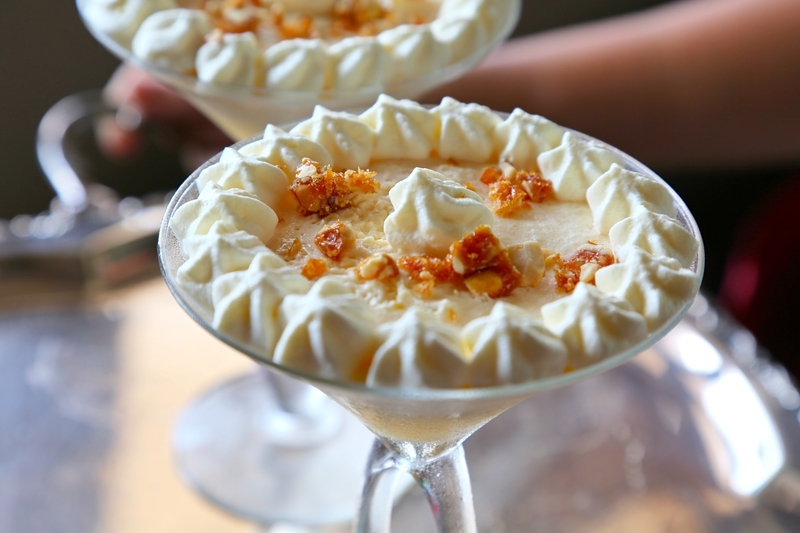 Top with almond praline and more whipped cream (if desired) just before serving. If you omit the Parmesan you will need additional salt. You can also use Chilgoza, the Indian equivalent of pine nuts for the pesto. Set a stock pot of water to boil on high heat. Stir in a pinch of salt and cover. Heat olive oil on a medium flame in a non-stick pan and saute carrots about 2-3 minutes. Add zucchini and saute until tender but not mushy. Add chilli flakes and saute 30 seconds. When water is boiling add pasta and cook until al dente or to your taste. In india, I cook the pasta about 2 minutes less than the time provided on the packaging. In our heat and humidity I find the pasta continues to soften even after its drained. Drain pasta and reserve 3-4 tablespoons of the pasta water. Use the rest for a soup or dal. 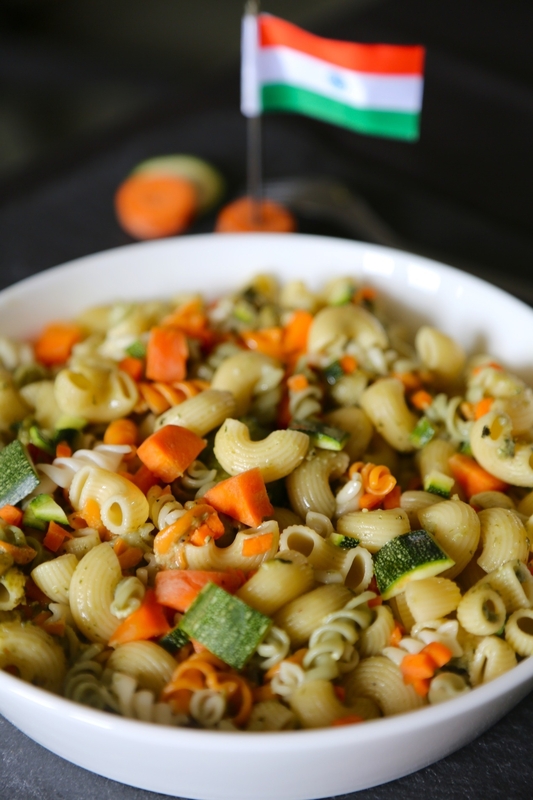 One the pasta is drained toss with half the sauteed carrots and zucchini. Puree the chopped rocket or arugula leaves in a food processor with garlic, pine nuts, parmesan and butter to form a coarse paste. If you are vegan omit the Parmesan. Toss pasta in the spinach pesto. Season with black pepper, garnish with more parmesan and remaining sauteed zucchini and carrots. You can replace the broccoli with basil for a traditional pesto. Ive shaped this as a mound but you could also do a log shaped terrine. Heat 1/2 tablespoon of the olive oil in a non stick pan and lightly saute carrots until tender. They must hold their shape and retain color so do not brown or overcook them. Cool carrots on a plate then sprinkle with pinch of salt. Puree the broccoli, pine nuts, remaining 1.5 tablespoons olive oil, Parmesan, butter or olive oil and garlic until you have a coarse paste. Stir in zest. Taste for salt. 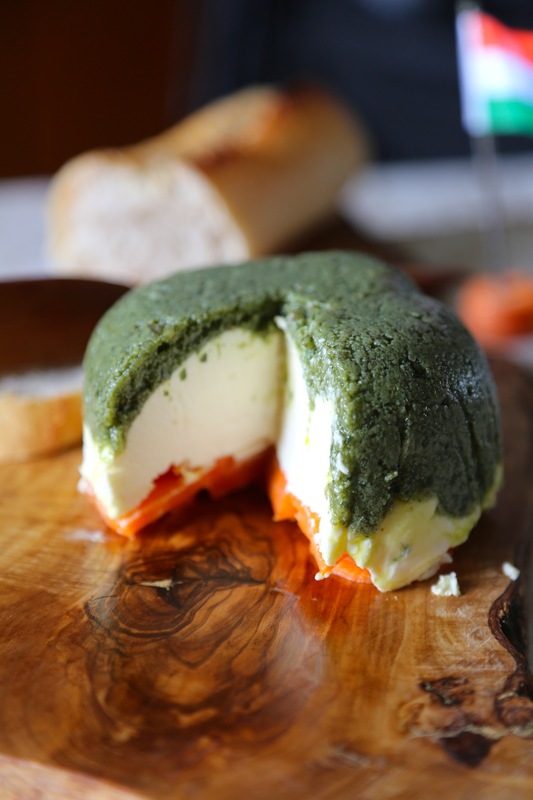 This pesto should be slightly salty to compensate the carrots and cream cheese. Line a 5 inch round bowl with plastic wrap leaving a large over hang of 4-5 inches on all sides. Whisk the cream cheese to a smooth consistency manually, using a whisk. Do not use a food processor. Layer the bottom of the bowl with the carrots layering one over the other in concentric circles. Place a round circle in the center to fill any gaps. Top with cream cheese. Smooth it carefully so it spreads evenly and presses against the pesto below. But do not mix the two together. 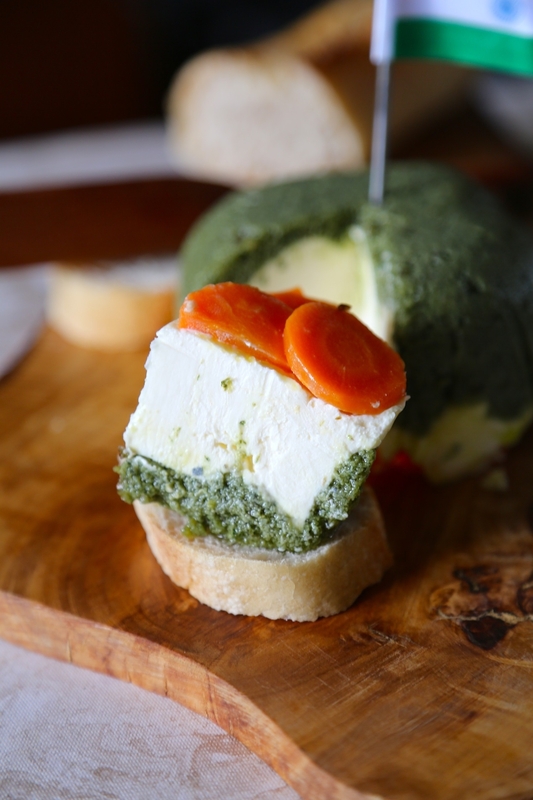 Layer the broccoli pesto over the cream cheese pressing down to ensure it spreads evenly across the bowl. Loosely place the over hanging plastic wrap over the pesto. Place in the freezer for 20 minutes. Prepare your serving plate and your crackers or sliced bread. Remove dip from the fridge and using the edges of the overhanging plastic gently pull the dip out of the bowl. Turn it carrot side up on your serving plate. Gently pull away the plastic wrap. Serve immediately with slicing and spreading knives. Shake or whisk together all the ingredients for the dressing. Taste for salt. Toss the peas in the dressing and refrigerate covered for 15 minutes. Peel the oranges and reserve the peel. Remove the skin off the segments of each Nagpuri santra and discard pith and seeds. If using navel orange cut the orange flesh into small pieces and remove all the pith and seeds. 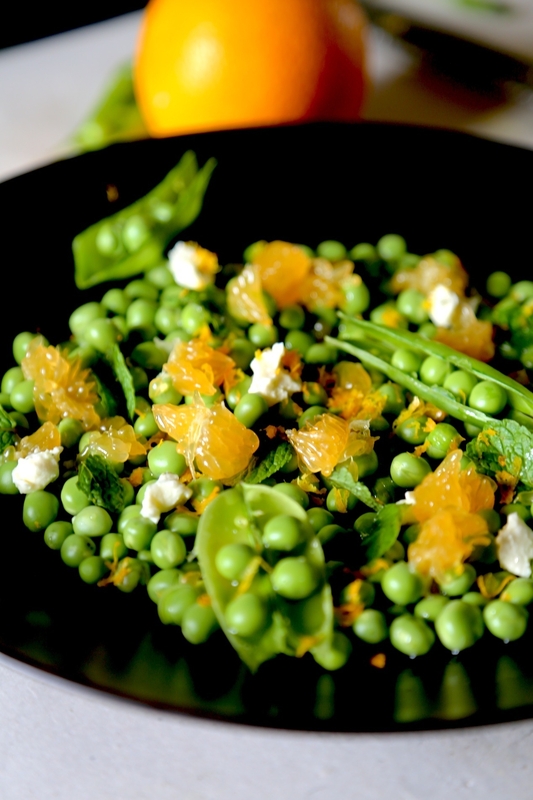 Remove soaked peas from the fridge. Taste for salt and sweetness-adjust if required. Pour soaked peas in a serving bowl. 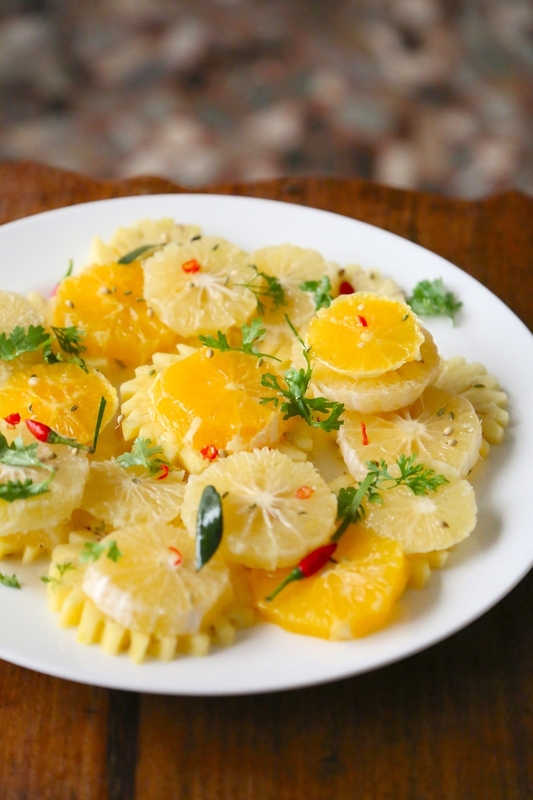 Garnish with mint leaves, cheese of your choice and orange segments. Lastly grate some of the orange zest from the peel over the salad. 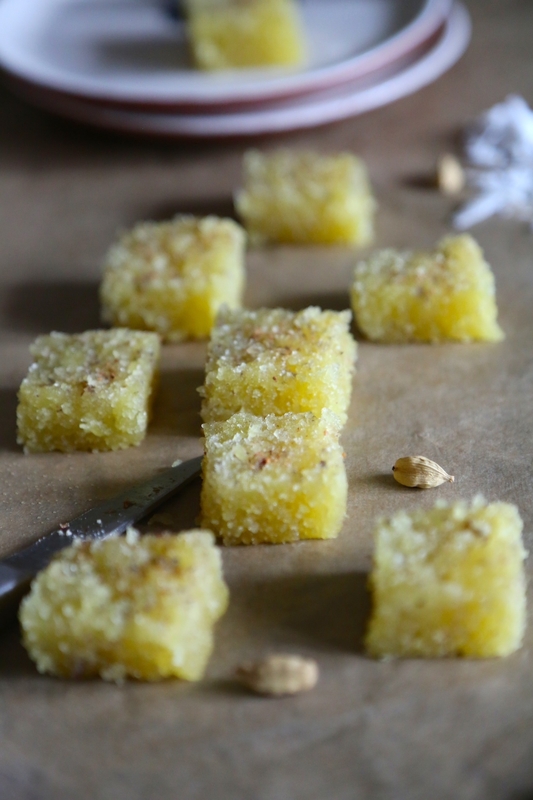 Coconut Barfi is often called Kopra Pak, Narylache Vadi and Khobryache Pak but in my home Vadi was made as a milk free candy with just sugar and coconut. While Vadi had a delicate brittle texture this Barfi is soft and moist. Heat the milk and sugar on a medium flame in a non stick skillet or kadai. When it reaches a boil add the coconut. Cook over a medium flame for 20 minutes. Stir regularly to prevent burning. Stir in the cornstarch paste. Stir in the khoya or mawa and cook another 7-8 minutes stirring continuously. Allow the mixture to thicken. Add the crushed saffron and milk and cardamom powder. Cook until mixture is thick, sticky and spreadable. Transfer the coconut mixture onto a parchment or wax paper lined cookie sheet or a pan approximately 8 by 8 inches wide. Spread it evenly using a spatula. Allow it to cool for atleast 30 minutes. Cover with plastic wrap, pressing the wrap down on the coconut and refrigerate 30 minutes. Remove from the refrigerator cut into 9 squares. You can cut smaller squares and make the squares thicker too if you prefer by using a smaller pan. Garnish with a little more cardamom powder and almond crumbs. Serve at room temperature. This raw salad is a margarita on a plate. It should be served with fruit knives and forks. 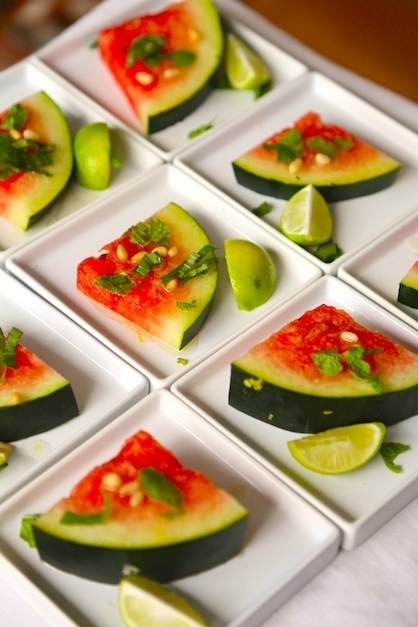 If you prefer you can also discard the rind and cube the watermelon instead and serve it as a tossed salad. Shake all the ingredients for the dressing together in a small jar. Refrigerate 2-3 hours or overnight. Place wedges on a large serving tray or in small individual plates. Sprinkle with pine nuts, basil and mint. Shake the dressing in the jar again and taste for salt. Spoon over the wedges. Serve immediately. SIFT THE FLOUR, COCOA, SALT, BAKING POWDER AND SODA IN A BOWL. ADD SUGAR, OIL, BEATEN EGGS, VANILLA AND MILK AND WHISK TO A SMOOTH CONSISTENCY. YOU CAN ALSO DO THIS WITH A STANDING MIXER. SLOWLY ADD BOILING WATER AND WHISK QUICKLY. BAKE FOR 30-40 MINUTES UNTIL CAKE SHRINKS FROM THE SIDES AND A TOOTHPICK INSERTED IN THE CENTER COMES OUT CLEAN. REMOVE FROM PAN AND COOL IN TIN FOR 45 MINUTES. UNMOLD ON A CAKE RACK AND COOL 2 HOURS. USING A STAND OR HAND MIXER OR A WHISK BEAT THE BUTTER AND SUGAR UNTIL SMOOTH AND FLUFFY. ADD THE COCOA AND CONTINUE WHIPPING. ADD THE MILK AND WHIP UNTIL FLUFFY. TASTE FOR SWEETNESS AND ADJUST IF REQUIRED. COVER AND CHILL UNTIL READY TO USE. STIR TOGETHER ALL THE INGREDIENTS EXCEPT RUM IN A SMALL SAUCEPAN OVER MEDIUM HEAT UNTIL SMOOTH AND BUBBLY. COOK UNTIL VOLUME REDUCES TO HALF. COOL COMPLETELY THEN STIR IN RUM AND RESERVE UNTIL READY TO USE. COOL COMPLETELY. POUR CHOCOLATE SYRUP OVER EACH CAKE AND LET STAND 15 MINUTES. FROST THE TOP OF ONE CAKE WITH BUTTERCREAM. PLACE THE SECOND SHEET OVER IT AND FROST THE ENTIRE CAKE. 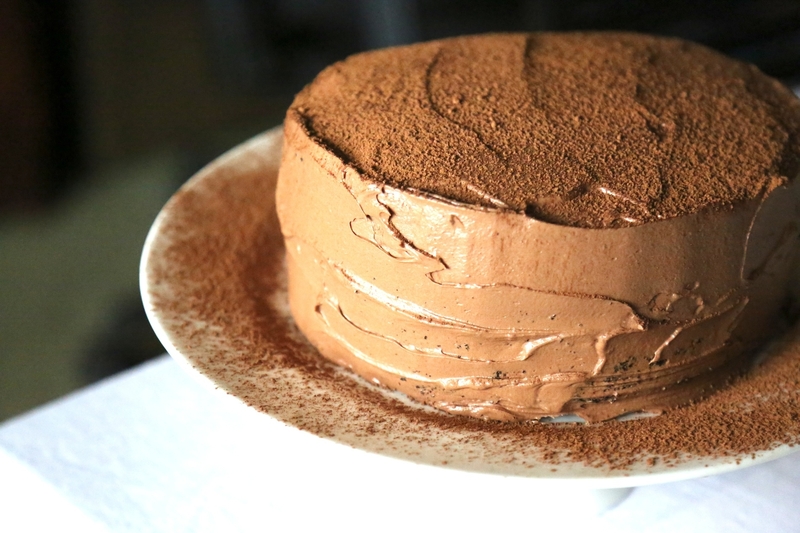 DECORATE WITH SOME POWDERED COCOA. We all need a little sunshine now and then! This salad has an infused dressing so make it the previous night and let the spices flavor the vinaigrette. Tastes great with a simple grilled chicken or fish. Toast the fennel and coriander seeds in a dry skillet over medium heat about 1-2 minutes until fragrant. Reserve 2-3 seeds each of fennel and coriander as a garnish. Cool the rest and pound in a mortar until only coarsely ground. Combine with all the salad dressing ingredients in a jar, shake well and refrigerate overnight. Remove dressing from the fridge shake again. Strain the dressing through a small sieve. Discard the pieces and leaves. Taste the vinaigrette for salt and sweetness and adjust with more salt and honey. Remember the fruit is also sweet. Arrange the salad on a large round plate. Remove any peel or white pith around the rings of fruit using a sharp paring knife. Place the pineapple rings at the bottom in a circle. Drizzle lightly with dressing. Layer over the pineapple alternately with oranges and mosambi. Drizzle generously with the remaining dressing. Cover with plastic wrap and refrigerate for an hour. allow the dressing to seep into the fruit. Garnish with sprigs of coriander, a few coriander and fennel seeds, chillies and lime leaves before you serve it.